MATURE CONTENT WARNING: The Bayonet Scars novels are a dark and gritty romance series which features graphic sexual content, violence, and foul language that is intended for a mature audience. Each novel features a different couple, though it's not recommended that they be read out of order due to the series story arc. I went into this book with some trepidation knowing snippets of this couple past from previous books, especially Wyatt's 'dating' history and I have to say at the start of the book I was afraid, really really afraid. I don't love a relationship in where one of the main characters is shown in other 'relationships' when you know that characters heart belongs to someone else. To put it simply it makes MY heart hurt. I knew what I would be getting into with Wyatt and Amber so I have no one to blame but myself for my hurting heart but I have JC Emery to thank for putting it back together. Wyatt Strand and Amber Wallace were childhood sweethearts, destined for happiness, love, and influence, and control as the up and coming power couple of the Forsaken Motor Cycle Club until it all fell apart as Wyatt looses himself to the club and his demons. Having no other recourse young, pregnant, scared, and emotionally destroyed Amber flees Forsaken heading back to Detroit, her only thought now is protect her unborn child from the one man who had promised to protect and love her but can no longer be trusted. Fourteen years have passed, years of occasional meetings and hookups between Wyatt and Amber, years of secrets, years of destructive behavior, years pain, years of heartache. Now Amber is headed back to Forsaken, back to the man that almost destroyed her, she's coming to give him his past and his future if he's willing to make amends, become the man she needs...if he's willing to take it. Amber is one of my favorite Heroines in the Bayonet Scars series. She's a strong take no shite woman. She's grown up in the club, she knows the rules, she knows her 'place', but she also knows that she has a lot to give to the club and she isn't going to put up with any of the clubs bullshite. There's power in being an 'Old Lady', especially the 'Old Lady' of the President, and she is going to use it. One thing I have always struggled with in the Bayonet Scars series is the double standard, do as I say not as I do, thing the guys have going on, so I loved that Amber basically said NO, that isn't acceptable. She knows that there is a code in the club house that the women WILL show respect for the men and she has no problem with that but she also has no problem saying if you want that respect you will give it back to me. Thank you Amber for that because I have wanted to smack a few of these guys around, especially Wyatt, for 6+ books now, haha. Wyatt, Wyatt, Wyatt...I struggled with Wyatt in the beginning. I wasn't joking when I say that my heart hurt the first few chapters of this book. He was breaking my heart right along with Ambers and I alternately wanted to stab him in the eye with a pencil and hug him until he got past all his issues. What I did like about Wyatt is that he makes NO excuses for his behavior. He owns his faults, he fights for his family, to make amends, and to become the man everyone needs, especially those he loves. I have loved this series since book one. These guys can be right pains, but their hearts are huge and their desire to love and be loved even bigger. The women are all in their own ways strong and perfectly suited to handle their men. Whatever fault in temperament the guys of Forsaken seem to have their 'Old Lady' makes up for it, complementing them, making each other whole. If you are looking for a suspense filled series, hardened men, strong women, and ultimately the best kind of love stories than let me suggest this series. Haunt has been the most difficult for me to get through emotionally which is kind of hard to believe considering Ian and Mindy's story in Burn. 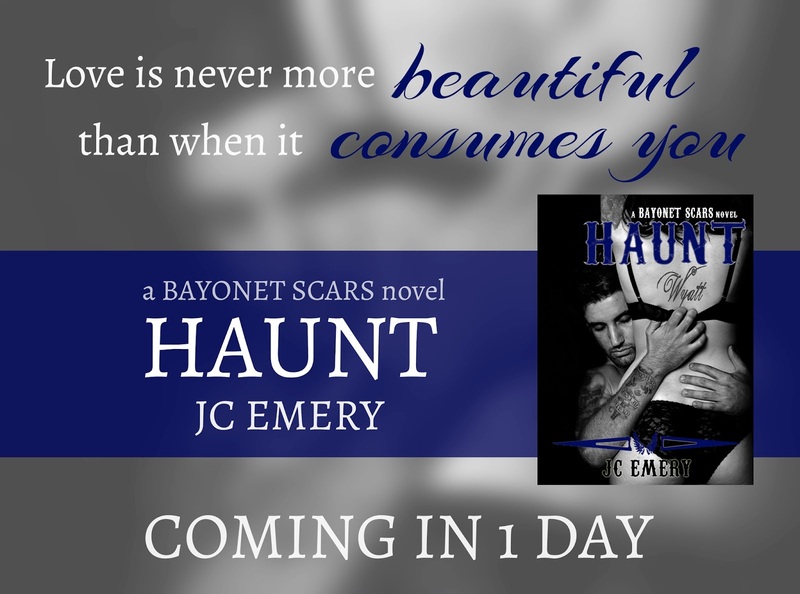 While Burn was challenging to read it just didn't make my heart ache the way it did for Wyatt and Amber in Haunt. Thankfully like I said above thought, JC Emery makes it all work, she makes it all right and you'll walk away wanting these couples stories to never end. Due to the nature of the story line (the battle between Forsaken and Mancuso) I HIGHLY suggest reading these books in order as a series. SHE'S HEARTBROKEN. HE'S A HEART-BREAKER. Elle Phillips's relationship with the Forsaken Motorcycle Club is strained, much like the relationship she had with her father, a Forsaken brother, before he died. The only piece of Forsaken that Elle wants to hold onto is their sergeant-at-arms and her former lover, Sterling “Bloody Knuckles” Grady. Unfortunately, Grady's moved on and he doesn't seem to be coming back. With her heart hurting over one man who's died and another who's practically dead to her, Elle throws herself into her work as a private investigator and tries to keep a low profile where the club's concerned. But when a case comes along that she can't refuse, she finds herself embroiled in club business in a way that leaves her questioning everything she thought she knew about Forsaken. Diesel knows that keeping tabs on Elle Phillips is going to bring him trouble. He already loves her even though he barely knows her, but when Grady asks Diesel to keep her safe, he can't say no. His patience has run out and he's going to do anything to get Elle to realize he's the man she's been craving-- even going behind the club's back to help her solve a case she shouldn't be working.